At this point you must be asking yourself, “What is it? It must be something incredibly strange to draw this sort of reaction.” Well, it’s not that odd at all. It’s simply salted, fermented black carrot and turnip juice. See? Not weird at all. Last week, I spent some time in downtown Adana with Gökhan Bey at Arzu Şalgamı. 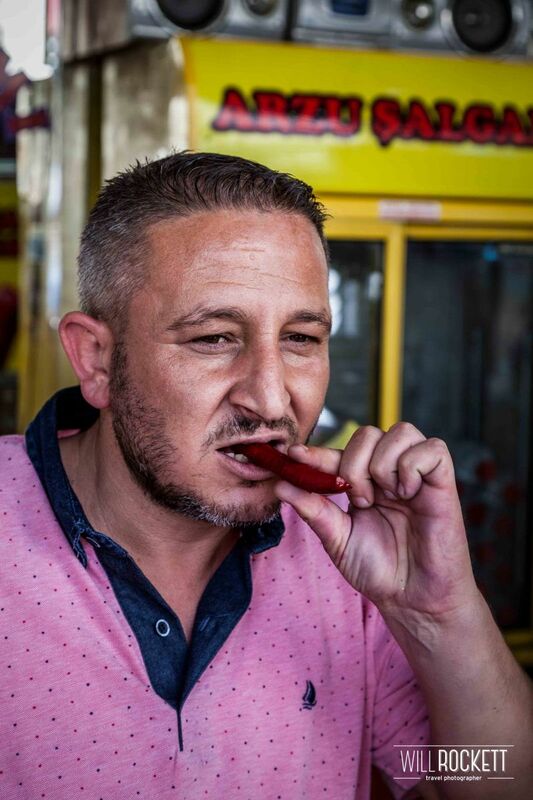 He sells only two things—şalgam and simit (a sesame-covered bagel that is famous in Turkey) —and he sells A LOT of those two things. In the half hour we spent together, I’m guessing over 50 people visited his street-side şalgam bar. Some ate a simit, others didn’t, but everyone enjoyed a glass of the 1.25 TL (about 30 cents) şalgam. 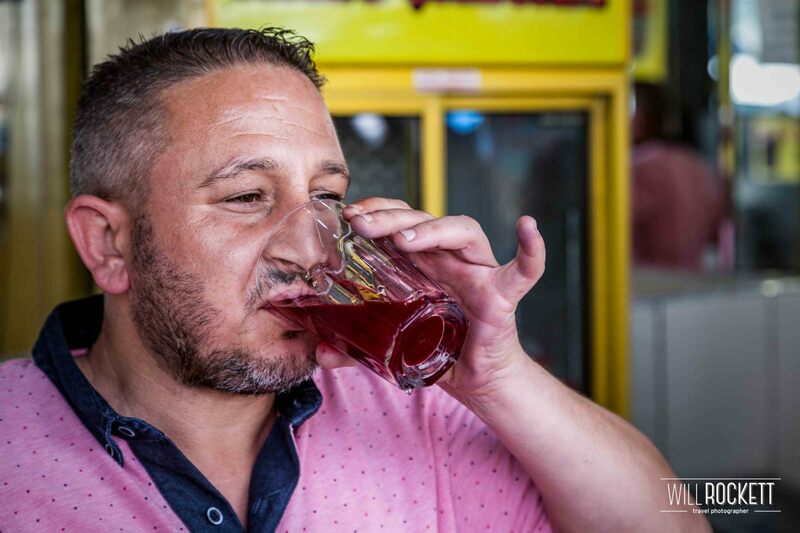 Over several glasses of his very spicy mixture, Gökhan Bey espoused the benefits of Adana’s famous elixir. It contains lactic acid, which aids in digestion. It’s full of vitamin B, which calms nerves. It promotes stomach and liver health. It contains calcium, potassium, and iron, which strengthen bones and teeth. To sum up, şalgam is the definition of healthy. 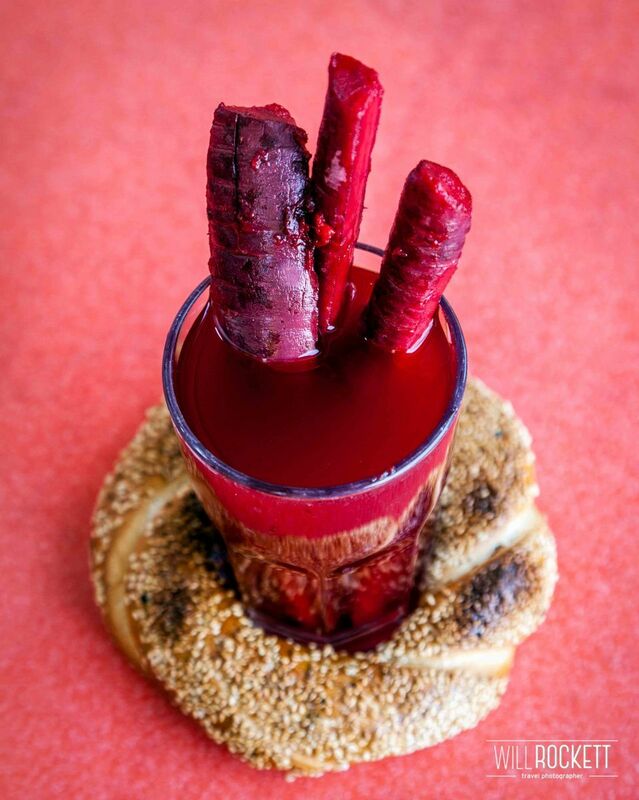 ** You can enjoy a glass of şalgam with our black carrot spears in your drink. **I have no idea if these health benefits are real, but Gökhan Bey believes it! Şalgam is served both acılı (spicy) and acısız (non-spicy). 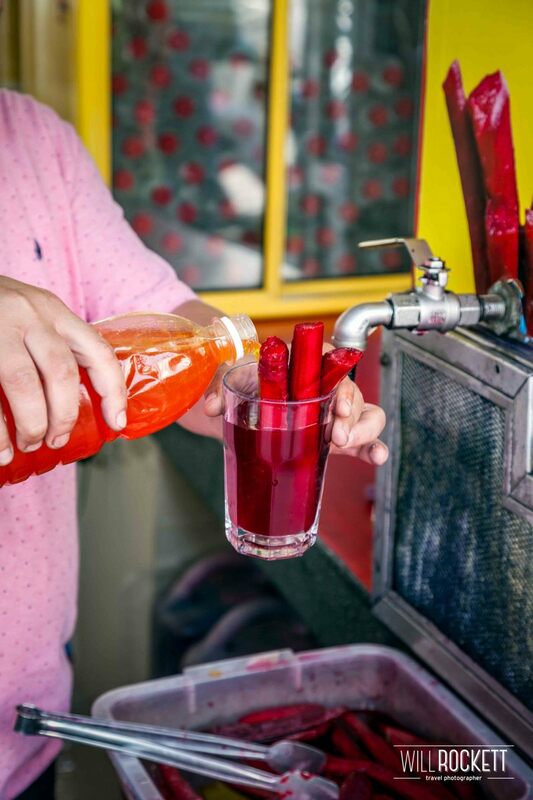 The acılı version is made exactly like the acısız, but with a spicy red pepper liquid concoction added. Depending on the brand or who makes it, the spiciness can range from a slight tickle-on-the-taste-buds spicy to “I need a drink to wash down this fire in a cup” spicy. 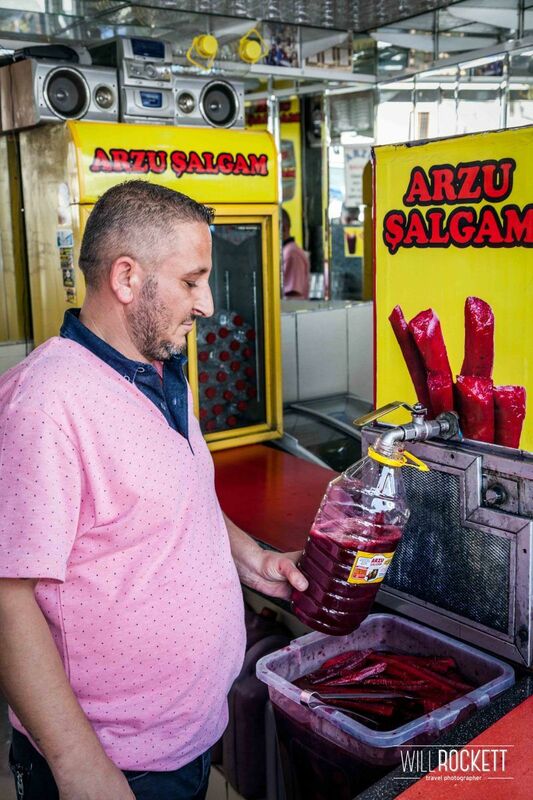 Şalgam is sold in bottles in grocery stores or at street vendors, like Arzu Şalgamı, all over Adana. In this picture, Gökhan Bey adds the spice mixture to a customer's drink. There are no scales, measuring cups, or any other precise measurements. Gökhan Bey just knows when it is the perfect amount of spice. At this point you must be asking yourself, “What does it taste like? It must taste incredibly strange to draw this sort of reaction.” Well, it’s not that odd at all. It’s simply tastes like salty, spicy (if you go with the acılı), slightly spoiled pickle juice. See? Not weird at all. 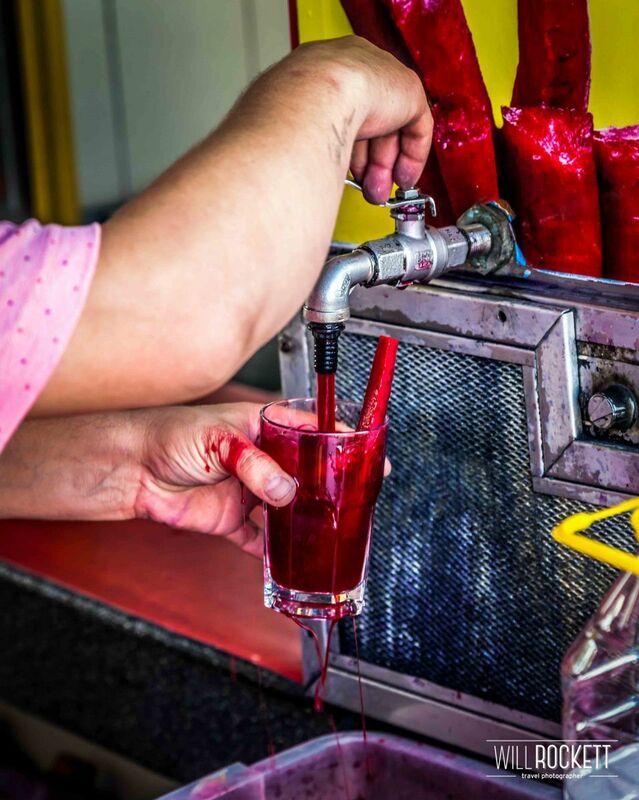 If you enjoyed your glass of şalgam on the street, you can take home a jug to friends and family. Gökhan Bey sells his pride and joy in 1, 2, 3, and 5 liter jugs, and ships all over Turkey. I'd like to sincerely thank Gökhan Bey for the time we spent together. If you are ever in Adana, I HIGHLY recommend you visit Gökhan Bey at Arzu Şalgamı. He is located just next to the Yağ Cami on downtown Adana (https://goo.gl/maps/uSArU6XUy9T2).